Our Time Tracker App is a simple and effective solution for your tracking problems. ‍Track work hours, generate reports and bill clients with our time tracking software. Track time in real-time or manually add time logs in our iPhone, Android or web timekeeper app with a single click. Know exactly how you spent your work hours at the end of the day. Add additional information and descriptions to time logs and assign them to specific projects and tasks. Detailed and accurate time logs are easier to categorize,interpret and learn from. All the data from your time logs can be edited. Fix your inaccurate time logs and make time tracking more accurate and beneficial. 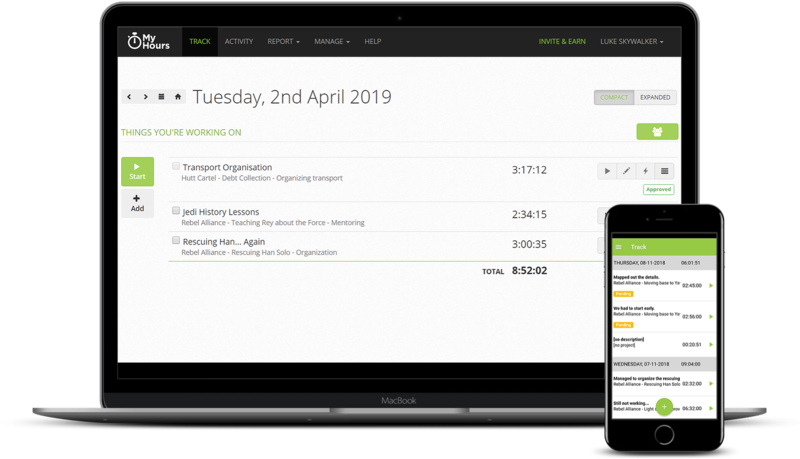 Manage time logs from your team members and ensure time tracking is integrated and accurate as possible. Your leadership decisions will be easier with accurate time tracking data backing them up. Exact and fast billing and invoicing features. End the cooperation with your clients with ease and accuracy. Generate and export insightful and visually pleasing reports. Learn and benefit from smartly organized data when you need it most.